Punj Lloyd Delta Renewables is just four months old. The company has already become the largest Indian engineering, procurement and construction (EPC) player in solar power, thanks to its first mover advantage. The company, a joint venture between Singapore-based Delta Renewables and Indian infrastructure major Punj Lloyd, has bagged about Rs 300 crore (Rs 3 billion) worth of orders, a majority of which are from the Bihar government. Tariq Alam, CEO, says "our start has been much better than we anticipated. Opportunities coming up are going to be very huge in solar power". The sun is shining bright for many others players in the solar sector as well. Balaji Lenka, director of Schneider Electric India, agrees. "A clear picture on opportunities in solar will emerge within a few months once the government approves the investments for the first 1,000 Mw," he says. A few weeks ago, Schneider launched its advanced power electronic products and systems for the renewable power market in India, mainly targeting investments coming up in the solar energy space. "Incentives offered by the government are irresistible for any business house," says Yash Birla, chairman of Yash Birla Group, which is planning a Rs 2,000-crore (Rs 20 billion) foray into solar power. Image: Solar panels sit on the roof of SunPower Corporation in Richmond, California. No wonder, solar project specialists have lined up huge investments in India in this sector. After the announcement of the Jawaharlal Nehru Solar Mission -- which aims at a quantum leap in solar power installation in the country -- at least 25 companies have come forward, with investment proposals totalling over Rs 100,000 crore (Rs 1 trillion) over the next three to 10 years. These proposals are from public sector power producers, oil marketing companies and even jewellers like Silver Smith India. The Mission targets 20,000 megawatt (Mw) of solar power by 2022. "The outlook for private investment in renewable energy sector, especially solar, appears very promising," says D R Dogra, managing director and chief executive of Credit Analysis and Research. 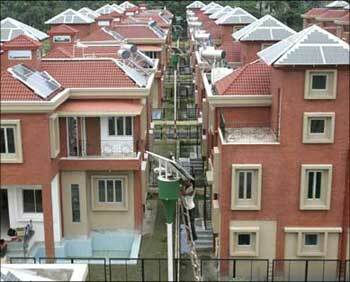 Image: A labourer checks the solar panel of a street light at a solar housing complex in Kolkata. The capital cost of developing solar energy is about Rs 16-18 crore (Rs 160-180 million) per Mw, which is over four times the investment required in conventional coal based thermal power generation. Solar power also requires huge areas of land to set up such units --- at least 5-6 acres per Mw ---- and land acquisition is a major challenge for any industry in India, according to industry officials. 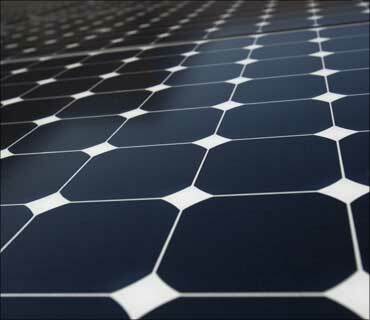 To make solar power attractive, project developers have been offered many fiscal incentives, including a 10-year tax holiday for photovoltaic (PV) and thermal solar plants set up by 2020, reduced customs duty and zero excise duty on specific capital equipment, critical materials and project imports, besides loans at cheap interest rates. Additionally, as per the Generation-Based Incentive (GBI) programme, the Government will provide financial assistance of Rs 12 per unit in case of solar photovoltaic and Rs 10 per unit in case of solar thermal power fed to the electricity grid from a grid interactive solar power plant of a capacity of 1 MW and above for a period of 10 years. Solar equipment makers will also get several incentives as per Special Incentive Package, for setting up integrated solar manufacturing plants. Last year itself, the government had received about 15 proposals worth over Rs 1.2 lakh crore (Rs 1.2 trillion) under the Special Incentive Package Scheme from solar and photovoltaics (PV) manufacturers. 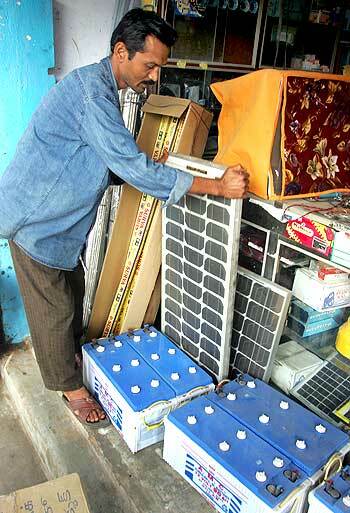 Image: A shopkeeper adjusts a solar panel at his shop in Gosaba. "There is enormous potential for off-grid PV deployment in India, based on real needs and benefits, in the areas of rural lighting and electrification, for powering irrigation pump sets, back up power generation for the expanding network of cellular towers across the country, captive power generation, urban applications and highway lighting, notes K Subramanya, chief executive of Tata BP Solar, in a recent presentation. But amidst the optimism, there are concerns in some quarters on the viability of solar power as a business in the country. 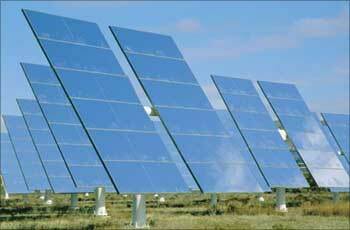 Solar energy itself is in a nascent stage in India, with less than 10 mw of installed capacity. India has a total installed generation capacity of almost 160,000 Mw. In addition to costs, and land acquisition challenges, manpower and technology capabilities are also areas of concerns. 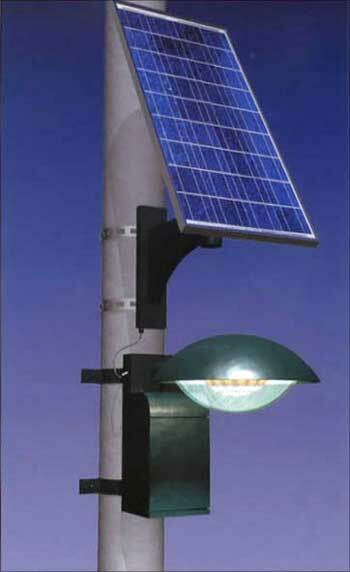 Image: A solar-powered street light. Moser Baer Photo Voltaic, a wholly owned subsidiary of the global technology company Moser Baer, plans to commission its second solar farm in the country in the next quarter. The 5-Mw farm will be set up in Tamil Nadu, with an investment of around $20 million (Rs 90 crore) and a farm of similar capacity will be set up in Rajasthan after that. Recently, the company commissioned its largest Thin Film solar farm with an installed capacity of 1 Mw at Chandrapur in Maharashtra. This project was awarded by Mahagenco, a government of Maharashtra power generation company, and Moser Baer signed a consortium agreement with Germany-based SunEnergy Europe for this project. The farm has been set up using amorphous silicon thin film technology and is connected to the 33 KVA local grid. "The government has announced its solar mission and we are setting up these grid connected solar farms as part of this. We started with a 1-Mw farm but in future, the capacities will be between 5 Mw and 15 Mw," said Yogesh B Mathur, CFO, Moser Baer. However, the company has not collaborated with any foreign partner for the Tamil Nadu plant.